Supporting ERTA is an investment in common sense! I attach our poster for our conference 27th April. As you will see, we have a full schedule of speakers and have a few places left for pre-booking delegates to come to the event for what promises to be an entertaining day. Campaign for Better Transport are much bigger than ERTA and have this year launched document and campaign calling for a plethora of line reopenings and rebuilds across the country to foster the benefits reconnecting to the rail network brings as witnessed by the success of the rural 'Borders Railway' from Edinburgh - Tweedbank (http://www.campaignforbordersrail.org/ ) whereby in a couple of years, turning on it's head the sceptics and arm chair critics and even seasoned professionals, has bucked prediction and exceeded to over 4 million people and rising. Now doubling track and more and better rolling stock for a 'bursting at the seams' service is the order of the day and extension to Carlisle is by no means ruled out with Harwick and early extension being sought after, bringing more of the benefits of sustainable transport, footfall and spend to town centres and allowing employment nearer to where people live to be an all year round possibility. ERTA's conviction is that we need a rolling programme of line reopenings and rebuilds/new builds across the English Regions and our reopenings pamphlet pin points some considered schemes but is no means exhaustive. What gives, what takes depends on a raft of possibilities but securing local authority support, coalitions forming to pool resources and investing in case making studies are foundational to securing more interest and support at the strategic levels. Of course it can be argued that if we want to reduce global warming, cut carbon emissions and keep the world moving we must invest in rail as a carrier of people and goods now more, but wisdom suggests you get more for the £ by investing in conventional rail which carries passengers and goods not one or the other per se. So #HS2 at huge cost will only cater for passenger use, Bedford - Cambridge apparently is mooted the same, which is misguided in our view. Government needs to come off the fence, local councils need to have their own counsel and take a lead in pointing what they wish for and negotiating towards that and the public too must accept and expect carrot in more choice with stick in more costs beit energy wasted, time wasted or penalties. Can we get the balance right? 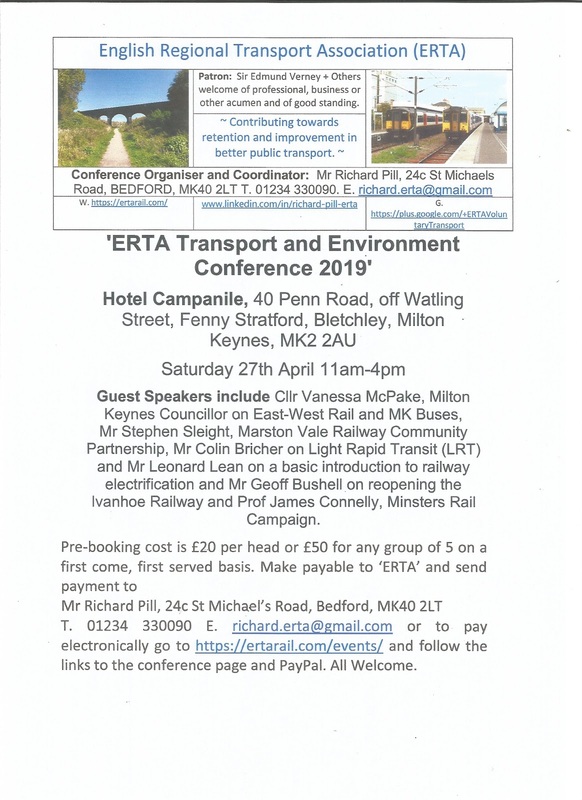 Jury is out currently, but as a long standing ERTA and Campaign Advocate for Bedford-Cambridge, I welcome a call beit from industry, business or councils to discuss why the traditional route pragmatically is the best option for Bedford-Cambridge and probably cheaper than brand new build on virgin soils with precarious blockages and challenges new to over come. If you agree, please join ERTA and support us - our website is progressively updated: https://ertarail.com/membership/ and our events are open to all, without obligation. Frankly I think those who say "we cannot possibly give a talk on the West Coast Main Line because by association people may think we support your aims" is daft and wrong and in fact the Rail Industry and Network Rail need to with Government find a new Strategic Rail Authority to implement a rolling programme of reopenings, rebuilds and select conventional new builds and be like the Road Haulage Association, RAC, AA and Road Transport Association and plum for rail unadulterated and unashamedly as they do for roads, oil companies do for oil, gas companies do for gas and so on. Why is rail mooted, cordoned and hedged to 'maintenance, status quo and creaking at the seams fix its'? Again we call for change and welcome our voice to grow as it is, so we can improve on quantity and quality in our advocacy roles. Thank you. Two Important Events - All welcome, first come, first served. Bedford Borough revises 1980's road link idea rather than send traffic around the Bypass! My own view of the below translation from more homes to where to how is as follows: his claim this will reduce congestion is spurious, it at best will shift it. It is well known more capacity attracts more traffic. It would use railway arches and land to get to and from the Commercial Road Junction and unless demolition will happen creating a large roundabout, could be a problem for buses, large lorries and other long vehicles turning into Preben Street. Council have identified brownfield land for more urban housing with presumably more traffic. It should be directing north - south movements to the bypass and around urban Bedford not encouraginging another High Street flow through residential areas. Again the Mayor puts a hard sell gloss on it, but it won't cut congestion overall and end to end of the road will be more congested in all likelihood. The Borough consigns East-West Rail to existing rail layouts rather than station remodelling and designs, which will restrict access and adds to less than optimum rail access to Bedford, which could provide more alternatives. 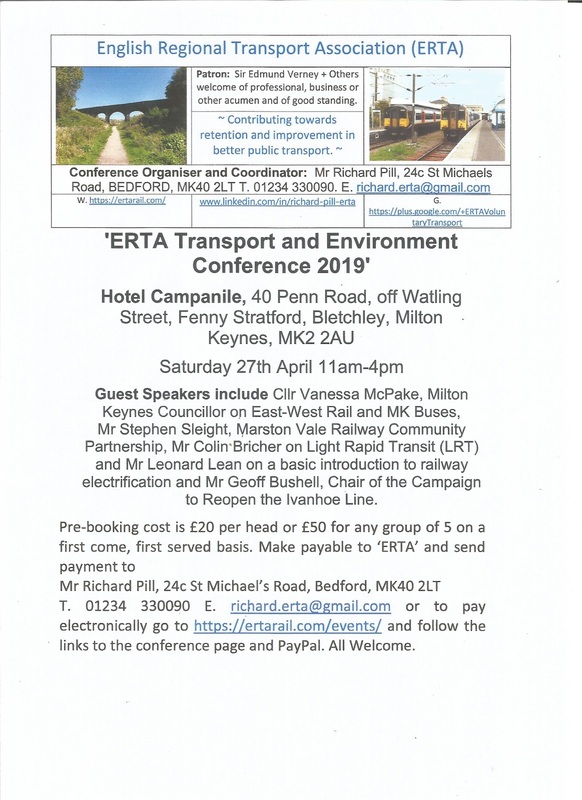 It strikes me as strange Mayor Dave can find £10 million capital funds towards a Wixams Station and now this road scheme, but cannot do the same for a station on the Bedford-Bletchley line to give access to the Retail Park, which studies have shown would boost and win, win for all? In short it seems ill-thought out or rather pandering to pop motoring interests and developers not necessarily public transport, emissions reduction or greener transport solutions making development more sustainable. Bedford Borough Council has submitted a bid for £15m of government funding to help reduce congestion at the Prebend Street / Midland Road roundabout. Working with Homes England, the Council have developed the plan since submitting an expression of interest last year, and have now submitted the revised bid. The new relief road would link the bottom of Ashburnham Road with Commercial Road West, reducing the number of cars queuing along Prebend Street and Midland Road, particularly at rush hour, while also helping to improve air quality in the area. "We call on the Government to abandon the HS2 Rail project." Click this link to sign the petition "We call on the Government to abandon the HS2 Rail project." March-Spalding In-rails! ERTA made 3 local newspapers calling for protection of the remaining route from piecemeal development and arose the local MP RT. Hon. Sir John Hayes CBE MP to write a letter to South Holland Council supporting our calls. For this we are grateful. Others waded in and a bit of coverage in Rail Magazine showed we were making waves. 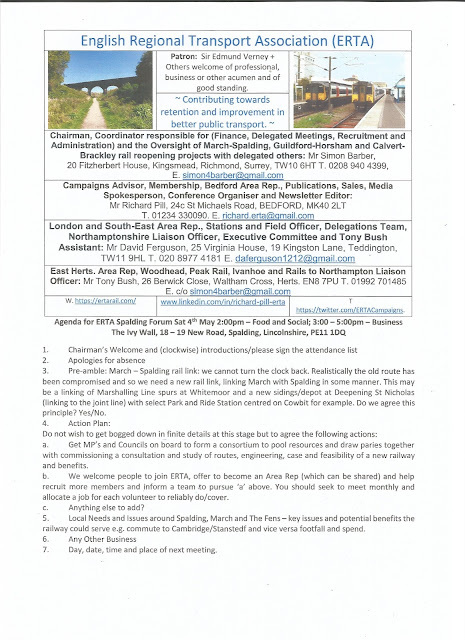 All welcome to our Spalding Forum: Saturday 4th May 1.00pm food and social, 2.00 – 4.00pm business, The Ivy Wall, 18 – 19 New Road, Spalding, Lincolnshire, PE11 1DQ. We want the councils to agree a new railway is needed and to pool resources to commission a study which could look at varying route options. We are not calling for every dot and comma of former rail route to be recovered, rather use it as a basis where complimentary to a restored railway link for all. Come to our conference - pre-book, network, enjoy, get inspiration and then apply it to your local situation/inform a team. Olney Battle - Support 'flat as a pancake'! Need big business to turn up and demand rail access! 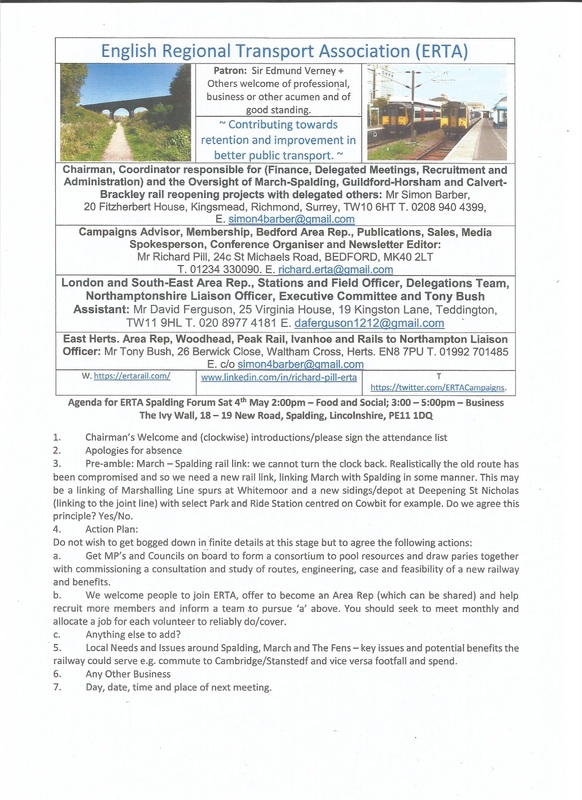 Bedford-Northampton Rail Link: A new railway is needed, but may never serve Olney again! Everything is in an economy of scale. If a big enough backer/s or consortium decides it wants a new rail link between Bedford/Midland Main Line and Northampton/West Coast Main Line Loop then they will study the lie of the land, decide the best course of action and set about doing it. Thus, the obliterations at Olney including new encroachments at Lavendon Road are poised to offer two solutions either 1. "here's the cheque, move" or 2. bypass Olney. If the railway goes north of the sewage works it will have to clear for juggernauts crossing the A509 at height out of a cutting from the top of a hill. To then go across fields (current status) to swing towards joining the trackbed somewhere east of Clifton Reynes, more like Newton Blossomville has to be pitted with a go north easterly from Castle Ashby lands around Piddington and go north of Lavendon and Turvey to join the old formation west of the Stevington Walk? It is a new 10 mile stretch of railway out of 21.5 miles of reconstructed railway. East-West, if not using the old formation, will be up to 20+ miles of new railway and so this region is to become physically familiar with reconstruction and new construction of local rail and so the model is proven and can be adopted and cascaded elsewhere. The credentials for Bedford-Northampton are long proven, Brighton/Cambridge to Bedford and Northampton to Birmingham and WCML Networks, Bedford-Northampton is the given growth, these trends will exacerbate, so all should be committed to keeping their options open, even Milton Keynes Council and jurisdiction. Alas they seem to have a back door 'treat Bedford-Northampton as development expedient' and chuck every developers whim at blocking it, by default of course, deliberation the jury is out! Feeds east-west rail and Midland Main Line, relieves north-south rails considerably and cuts cross country saving time and cost, cutting congestion (A14 Inc.) and ensuring good end to end joined up rail alternatives to car culture and drive everywhere with queues for parking price managed ratcheting up everywhere because demand outstrips supply/land use conflict - do we provide housing, employment or parking - a no brainer x 3 options for same spaces often in urban areas or on urban fringes. ERTA calls for people to join and offer to help out. We're into the business of spreading the load, taking responsibility collectively and sharedly and together we increase chances of success and contrast privatised, selfish individualism and arm chair critics pouring cold water, need to reconcile with the problems on the roads, the air pollution killing people and many an accident partly underscored by the stresses and tensions around driving these days. This, when for a small sum, the wear and tear costs saved through rail alternatives could inform a more generous rolling out of a bus and rail pass for off peak travel for under 65's which would ensure more off-peak services are used and more lifestyle greener choices become more readily available. This, especially for lower income brackets for whom a vehicle on the road is a labyrinth of cost and responsibility when they just wish to be more mobile within limited fiscal means. Oddly bus networks are being slashed due to inadequate funding and inability to subsidise them, usage falls are mooted still, but the humbug is £billions are found annually for more and larger roads with pedestrians, cyclists and slower movers being brushed aside at design and actuation of schemes designed for speed rather than inclusion. Join our free email loop: richard.erta@gmail.com or go to our website: https://ertarail.com/ and have a perusal/make a contribution beit membership or a free-will donation. It all helps us help others. Thank you. Bedford-Northampton is not 'dead' it is sleeping and a new dawn awakens beckons with entrepreneurship, leadership, vision and a fresh start. Development encroachment on the old trackbed and realignment seems the only option but for compulsory purchase. friend Simon Pitt (from Bromley). The other ERTA members were Michael Hustwait, David Ferguson, Colin Crawford and Tony Bush. 1. Woodhead Route: As you may recall, Tony attended a meeting with National Grid shortly before Christmas in regard to its plans to build cables under one of the Woodhead Route's tunnels. That meeting apparently went very well and in fact National Grid accepted our proposals and are now 'on our side’. Other groups attended that meeting too, including Railfuture, Sustrans and the Don Valley Railway Association; Tony was particularly impressed with the last-named! Apparently heritage railways are a good way of ensuring that disused trackbeds are protected, as long as the new services do not jeopardise the heritage services. 2. East-West Central Section: We had all agreed that as regards the route between Bedford and Sandy, we should follow the old trackbed as much as possible. As you know, the trackbed has been built on around Sandy so the route will have to go slightly to the north of Sandy. However; we all insist that the East-West should connect with the East Coast Main Line as close to the north of Sandy as possible. We also agreed with Richard’s idea to amend the North Atlantic Coast to supporting specifically Okehampton-Bude and Bere Alston for Plymouth (i.e. to include Okehampton-Bere Alston). Another possibility (which is not listed in the brochure) is Malton - Pickering, which would connect the North York Moors Railway with the National Rail.